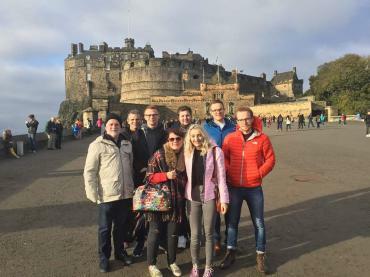 It was our privilege to travel to Scotland and spend a week with Larbert Baptist Church. Pastor Ken Bleakley, a former IBC student, has been serving the Church there for 12 years. The team got to work on Sunday when we took responsibility for both services. It was particularly encouraging to see a good number of children among a congregation of around 100 people. On Monday, we met Mike. Mike’s full-time job is to work with local schools, taking assemblies, running R.E. classes and SU groups. He spends his time building relationships with young people, while showing and telling them about Jesus. It was interesting to be with Mike and hear his plans. He was very open about some of the struggles he faces in this ministry. Another opportunity to help the church came at their senior lunch club, Young at Heart. This is a great work – most of those attending are not from the Church. Our thanks, to Ken and the Church for all their hospitality - we are praying that the Larbert Church will be blessed as they continue to move forward in the gospel.